Twitter's Night Mode feature changes the default color scheme of the social messaging site from light to dark to improve the service at night or early in the morning. The feature has been available in the Twitter application on Android and iOS since last year, and is currently being rolled out to all desktop users. 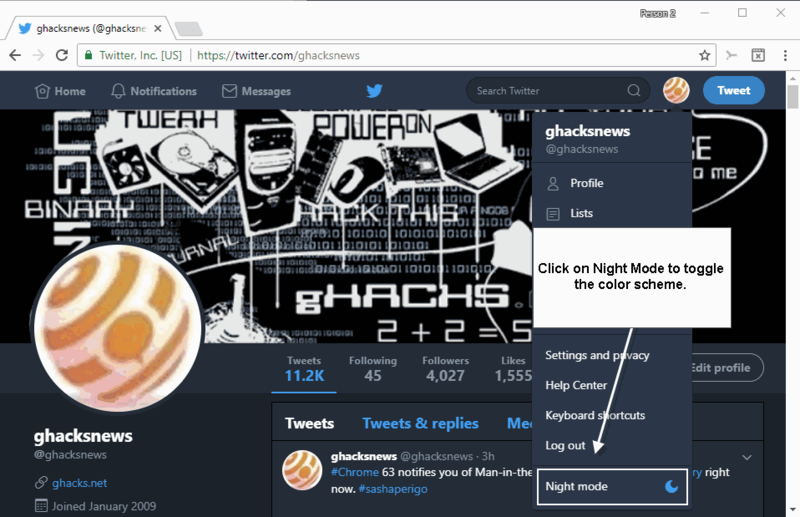 You can check to see if Night Mode is already enabled on Twitter's web version by clicking or tapping on your profile icon on Twitter. If you see Night Mode listed there in the menu, it is available. Activate Night Mode to change the color scheme of Twitter to a darker one. If you don't like it or want to change, simply select Night Mode again. The menu entry acts as a toggle between Twitter's default display color scheme on the web and the new darker color scheme. As you can see on the screenshot above, Night Mode makes little use of black but darker shades of blue and gray mostly. There is no option anymore on Twitter to make adjustments to the color scheme on the site. The only option you get is to change the theme color. Open your Twitter profile page on the site and select edit profile on it. Locate the "theme color" option and activate it. You may select a single color and make it the new theme color. Twitter suggests a couple of preset colors, but you are free to add a Hex code there as well to pick any color for that. This option is only available on the web however and not in Twitter's mobile applications. Open Twitter in your web browser of choice. Click on the profile icon on Twitter. Select Night Mode to toggle the feature. Tap on your profile icon in the Android application or on the Hamburger menu icon (whichever is displayed to you). There you find the Night Mode slider. Drag the slider to enable or disable Night Mode on Android. Tap on the profile icon in the Twitter application. Tap on the Night Mode icon to toggle the functionality. Now You: Do you prefer light or dark modes on the Web? Cursed Twitter, always finding new ways to get me to use it! Not seeing it on my end, hasn’t rolled out completely it seems. Why won’t they just add more themes instead ? Themes for colorblind people they seem to ignore if if i have nagged them about it since i signed up….